The problem with malloc() is not only that it can lead to heap fragmentation and a failure of the program at runtime. In many libraries, it is not reentrant or thread-safe (see https://stackoverflow.com/questions/855763/is-malloc-thread-safe). Using malloc() from a thread or from an interrupt is most likely a very dangerous thing! Avoid using malloc() is a good approach. But things get difficult if malloc() is used in libraries or middleware stacks. Many USB and TCP/IP stacks use malloc(). But that wrapper is effective if the application uses the FreeRTOS API functions pvPortMalloc() and vPortFree(). So what I ended up is changing the middleware sources to use pvPortMalloc() and vPortFree() instead. But what if it is not possible to change the library sources? The GNU gcov (coverage) library is one example. This usually is only available as binary library, and rebuilding the GNU library is a challenge on its own (see “GNU Libs with Debug Information: Rebuilding the GNU ARM Libraries“). Even worse: if using C++, then very likely it is using malloc() and variants in the background. With this turned on, FreeRTOS uses a newlib reentrant structure (see this FreeRTOS discussion). This requires several hooks implemented, for details please read Dave’s article. 💡 At the time of writing this article, the settings above are available in the implementation on GitHub, but not in the 06-May-2017 SourceForge release. 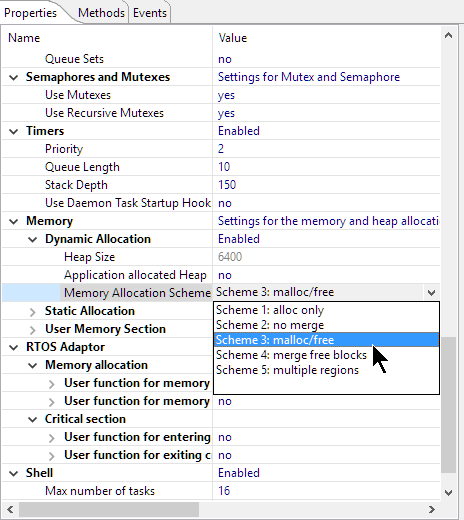 With using the new Scheme 6, obviously the normal FreeRTOS heap size setting is not used (configTOTAL_HEAP_SIZE). Otherwise, check your linker file for the correct symbols. If not, you have to add them. 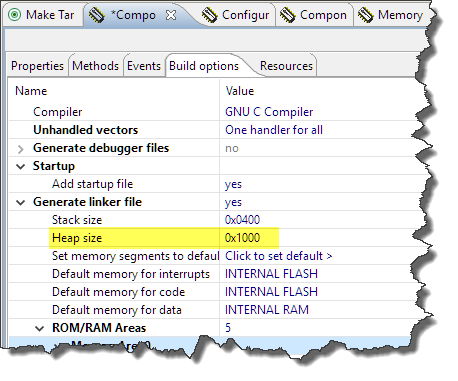 With this, you can use FreeRTOS with newlib memory allocation in a safe and reentrant way :-). Using newlib and newlib-nano and its memory allocation routines are problematic, especially to use it in a reentrant and thread-safe way. Malloc() can get used as a side effect with calling functions like printf(), strtok() and others in the ‘black box’ of newlib. If you have to use things of newlib or newlib-nano, then make sure you use configUSE_NEWLIB_REENTRANT with the heap_useNewlib.c from Dave Nadler. I have integrated Dave’s work into FreeRTOS, including a port to Processor Expert. If you want to check out the implementation, see https://github.com/ErichStyger/McuOnEclipse_PEx/tree/master/Drivers/freeRTOS. 💡 Many thanks to Dave Nadler for investigating and searching for a solution and give it back to the community! This entry was posted in ARM, Building, CPU's, Eclipse, Embedded, Embedded Components, FreeRTOS, Freescale, gcc, Kinetis, LPC, LPC, MCUXpresso, MCUXpresso IDE, NXP, Processor Expert, SDK, Tips & Tricks and tagged arm gcc, Building, dynamic memory allocation, Eclipse, FreeRTOS, Freescale, Heap, linker file, newlib, newlib-nano, NXP, Processor Expert, software, software project, technology, Tips&Tricks by Erich Styger. Bookmark the permalink. This article is very interesting. Congratulations! 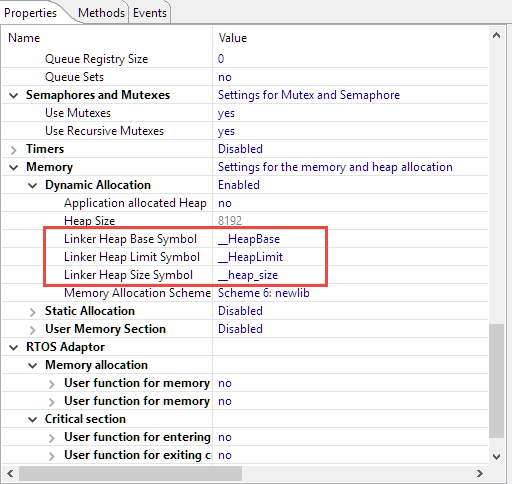 A question: How can I implement heap 6 and newlib nano in a SDK project without Processor Expert in MCUXpresso? I noticed that MCUXpresso adopts heap 4, by default. yes, you can. The thing is that the MCUXpresso SDK uses a version of the RTOS without the necessary patches. I usually create a SDK project, then remove the FreeRTOS and replace it as a drop-in replacement. I just installed the FreeRTOS version you recommended. What is the version of this FreeRTOS? That is not explicit in the directory name. Is it a custom version? KDS SDK 2.0 FreeRTOS version is 8.2.3 and MCUXpresso SDK 2.2 FreeRTOS version is 9.0.0. In none of them, there is a heap_6.c file. it is the version 9.0.0 with some of the upcoming features present on the ‘bleeding edge’ version from on https://sourceforge.net/p/freertos/code/HEAD/tree/, plus my extensions to support Segger SystemView and Percepio Tracealizer. And yes, what you are looking for is not heap_6.c, but heap_useNewlib.c. The name of the file does not matter at all. All what you need to make sure is to link only one version of the heap, I’m doing this with the configUSE_HEAP_SCHEME macro. Erich, thanks again for your efforts! It took me all evening but I got my CodeWarrior 10 project moved from EWL to newlib-nano and set up for newlib use in FreeRTOS. In case anyone else is attempting this, the EWL to newlib instructions in the CW docs are a good start, but you’ll need to not include -lrdimon and newlib expects __stack to define the top of stack or it’ll trash whatever your setup code set SP to when it uses its default. As for the FreeRTOS part, the big caveat would seem to be that the _reent struct adds more than 1 kB to the RAM overhead for each task. That’s pretty huge, especially since it’s mostly useless stuff like atexit() data. Defining _REENT_SMALL knocks that down by over 800 bytes. I’ll see later what I can do to reduce it more. I also had to set setbuf(stdout, NULL) for each task. Seems wasteful to use stdio when I’m just wrapping my own output functions anyway, but I’ve done it in this project for the sake of consistency. I discovered that I somehow had _DEBUG set to 1 in the Freescale bare metal USB stack and it was doing printf()s. No idea how long it’s been that way, but for some reason they weren’t causing trouble with EWL but immediately crashed with newlib. Switching to newlib increased my code size by around 10 kB but I haven’t had time yet to check where the increase was and if it was just a matter of configuration options. Don’t really care at this point, I’m just trying to get off of EWL and on to something still being supported and documented. Now what I want is a second heap, so I can separate the non-critical stuff (mostly interactive tasks that can safely fail) with more important stuff. There’s very little important stuff using dynamic memory allocation, but it’d be nice to reserve some memory for things like the task that occasionally checks a server for firmware updates, without the possibility that a user script will have used up all of the available heap. sorry for my delayed answer, cracy times :-(. Thanks for sharing all your steps and experience! You mention printf(), and I know that newlib and newlib-nano might use the heap memory for internal data structures. 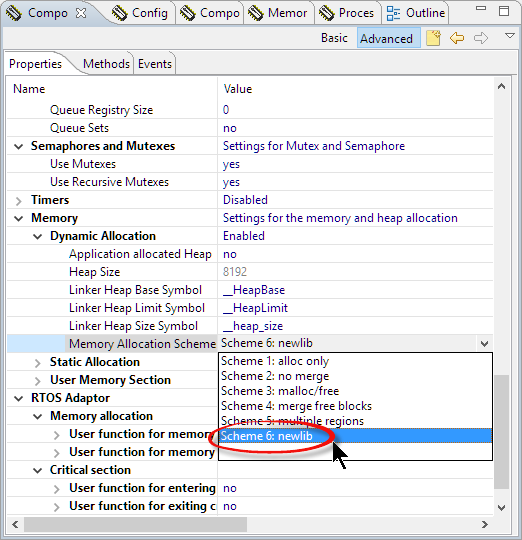 And placing the heap heap might be sensitive to the _sbrk() function, as this one tries to check for a stack overflow, but in case of FreeRTOS it would trigger a false alarm (see https://mcuoneclipse.com/2016/08/06/semihosting-again-with-nxp-kinetis-sdk-v2-0/ or google McuOnEclipse about _sbrk()). That might have been your crash with newlib(). While I was doing my initial testing I set a breakpoint in malloc() and didn’t see any calls from printf(), but I’ll need to double check that I was looking in the right place. I’ve moved the heap up to the top of SRAM_U, and the stack is down in SRAM_L. No trouble there so far. My printf() crash might have been because the USB stack only prints messages on errors and I hadn’t come across those errors until I screwed something else up during the change. I’ll pay close attention when I migrate the next project. The only other newlib quirk I’ve run into is that the ctype.h functions are implemented as macros with a lookup table, which throws some new GCC warnings about char subscripts because apparently I never paid attention to the fact that those functions take int parameters. I’m eliminating PEx components one by one and eventually I’ll try moving this to MCUXpresso. Probably not till after Christmas, though – can’t spare that much time for anything not needed for getting this project finished. Found another difference – looks like maybe newlib doesn’t support the sscanf() hh format specifier. Serves me right for switching to that newfangled C99 stuff a few months ago. I’ve gone years without using any variety of scanf() at all, but I got lazy and used it in this project for parsing a VT100 cursor position message. Of course, I"m using scheme 6. I'm certain I ran into this before and fixed it, but I don't remember how. I can get it to compile by changing the 5 to 6, but I'm sure that's not what I did before. I also don't know what I changed to cause this to pop up again. What am I missing? sorry for my late reply (cracy times…), and many thanks for reporting that problem! About where you can do the fix on your side: see https://mcuoneclipse.com/2012/06/30/cde-hacking-where-is-my-stuff-a-dissection/, but things have changed a bit with the latest PEx releases. Let me know if this does not work. I’ll prepare a component in that case. Erich any suggestions how to define the heap base, limit and size symbols when using FreeRTOS v10.0.1 with newlibnano on MCUXpresso (SDK v2, not PE) ? have a look at section “custom linker files” in https://mcuoneclipse.com/2017/08/29/tutorial-porting-blenrf-kinetis-design-studio-project-to-mcuxpresso-ide/. Was pondering how to solve this situation with two heaps as well. It is possible to make the newlib malloc() and free() functions threadsafe by wrapping them using the –wrap function of gcc. The original malloc() and free() function are renamed to __real_malloc() and __real_free() and all reference in the code to malloc() and free() are renamed to __wrap_malloc() and __wrap_free(). Allowing us to implement __wrap_malloc() and __wrap_free() our selves and call the original __real_malloc() and __real_free() after making sure no context switches occur while in the __real function.